Porsche Cars North America (PCNA) announced the appointment of Brian Redman as Official Ambassador to Rennsport Reunion IV. In his new role Redman will serve as an advisor to PCNA’s organizing team in the months leading up to the October 14 to 16 event and represent the company vis-à-vis race fans and participants in all Rennsport related matters. “I can’t think of a more qualified person than Brian to help us realize another successful Rennsport Reunion”, said Detlev von Platen, President and CEO of Porsche Cars North America. “Not only was he instrumental in designing and organizing the previous venues, but with his own colorful racing history, not the least with some of our most famous race cars, Brian Redman personifies the spirit and fascination that we want to encourage with this next gathering of Porsche race cars and their designers and drivers”, von Platen added. Starting in 1959, Redman’s career has spun more than four decades of racing sports cars as well as Formula 5000 and Formula One. Although making a name for himself as an all-round talent, his biggest triumphs came in racing sport prototypes in the world’s most famous and notorious venues. From Nürburgring, Spa, Monza, Imola, the Targa Florio, Brands Hatch, Zeltweg, Watkins Glen to Daytona and Sebring, Redman won them all. As a member of 1969 factory team he helped Porsche win the World Manufacturers Championship for the first time in the 908LH and 908/2. 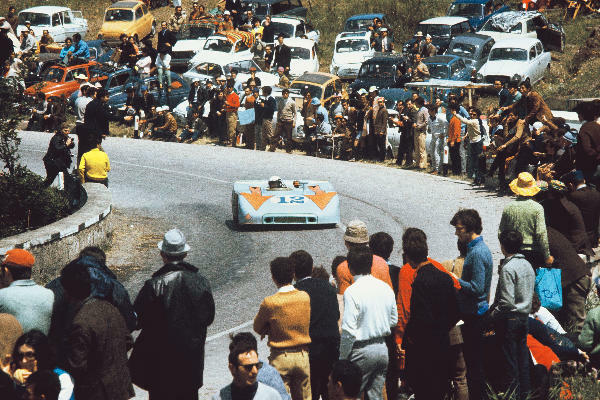 He then repeated this feat in 1970 with the 908/3 and awesome 917K. Redman still drives vintage race cars, organizes and promotes historic automotive events and provides individual and group driving instructions. A member of the Detroit and Sebring halls of Fame, he will be inducted into the Talladega Hall of Fame on April 14, 2011. Additional details of the Porsche Rennsport Reunion IV will be published on Porsche’s press web site (www.press.porsche.com), and Mazda Raceway Laguna Seca’s web site (http:// www.mazdaraceway.com), as they become available. Ticket information is available by contacting 800-327-7322 or online at www.mazdaraceway.com.